What is this test screening for? 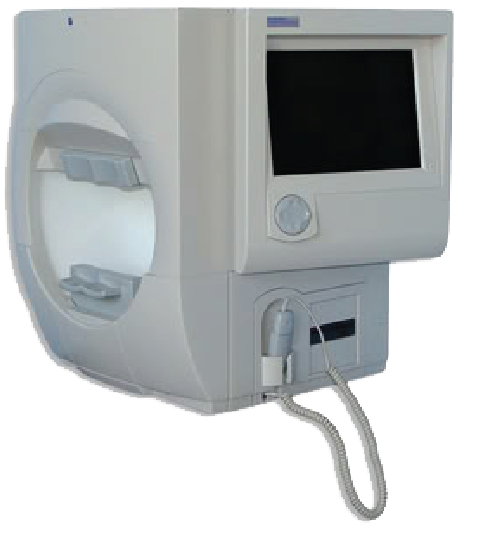 A Full Threshold Visual Field Analyzer is most commonly used to monitor or diagnose glaucoma and neurological diseases. Visual field loss due to retinal disease could be caused by anemia, blood vessel occlusion, diabetes, hypertension, retinal detachment, retinitis pigmentosa, macular degeneration, glaucoma and many more. The patient sits comfortably in front of the visual field analyzer, resting their chin in the chin rest. Using one eye at a time the patient will focus through the lens at a fixation light in the center of the screen and press a hand-held response button each time a white light appears around the screen. The test takes up to 8 minutes per eye, with the total exam lasting approximately 15 minutes.